Episode 24 - Live from BPLC Providence - Part 1 of 3 - Why Personalized Learning? 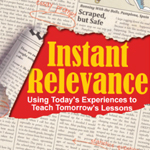 On Episode 24 of the Instant Relevance Podcast, Denis (@MathDenisNJ) and Raymond (@blended_math) are LIVE from the Blended and Personalized Learning Conference in Providence, RI! The hosts met in person for the first time and interviewed educators, innovators, and change agents throughout the symposium. Episode 1 in our 3 part series focuses on the question - "Why Personalized Learning?" The hosts begin by interviewing author of "Pathways to Personalization - a framework for school change" and Director of Research and Development for the Highlander Institute - Cathy Sanford (@csanford42). Next, Simona Simpson-Thomas (@simonamelanie1), Director of Multiple Pathways and conference keynote speaker, talks about how to reverse traditional labels we place on children in schools. Then, Paul Emerich France (@paul_emerich), NBCT Teacher at the Latin School in Chicago and Author of "Reclaiming Personalized Learning," reminds us that personalization goes way beyond just using technology in the classroom. Check us out next week for Part 2 of 3 where we delve further into equity and personalized learning.